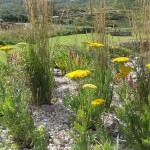 The planting design for this 20 metre long marine border in Kerry has arcs of different species of plants separated by bands of upright Karl Foerster grass which provides structure from spring to late winter. 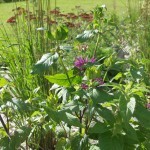 Provided there is shelter from prevailing winds, many herbaceous perennials are suitable for seaside locations. The planting is interspersed with Euphorbia characias subspecies wulfenii and Euphorbia martinii. 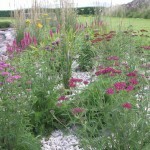 The marine border has lots of sun and good drainage as it is on a sloping bank between the lawn and driveway. 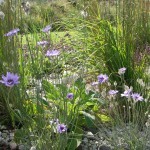 The plants are loved by bees and butterflies which buzz and flutter through adding their own colour and interest. 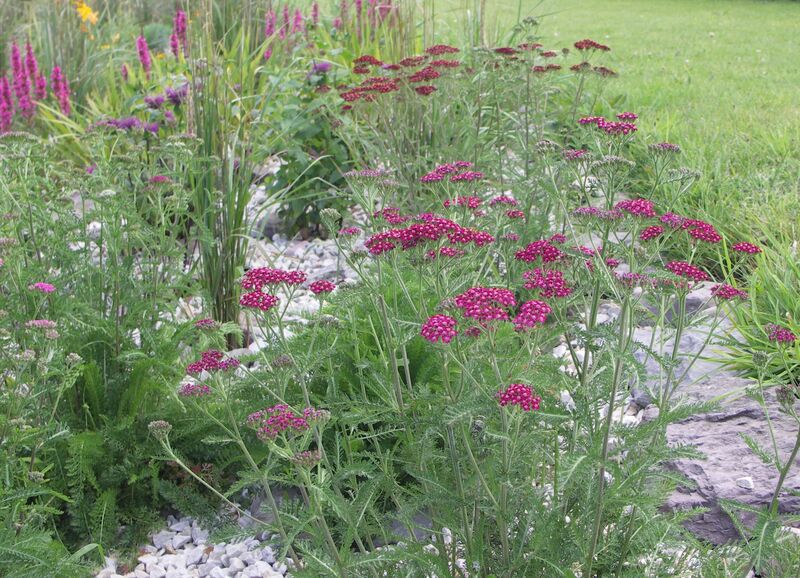 Two species of Achillea are grown here – Achillea millefolium ( ‘a thousand leaves’ ) and Achillea filipendulina ( ‘like meadowsweet’). 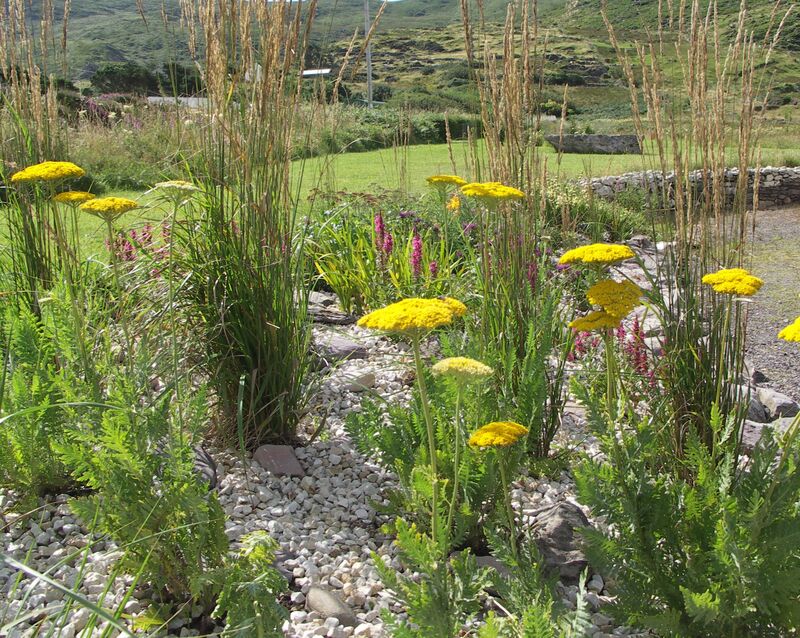 Both yarrow and meadowsweet grow prolifically in this Kerry location so these garden equivalents are good bets. The ‘Cerise Queen’ was grown from seed 9 months ago and has produced several different pink coloured heads which look gorgeous together. The foliage is very soft and feathery. ‘Gold Plate’ provides eye catching bright yellow plates of flowers and contrasts with the tall grasses and pink loosestrife. Its foliage is deeply cut and a bright green. 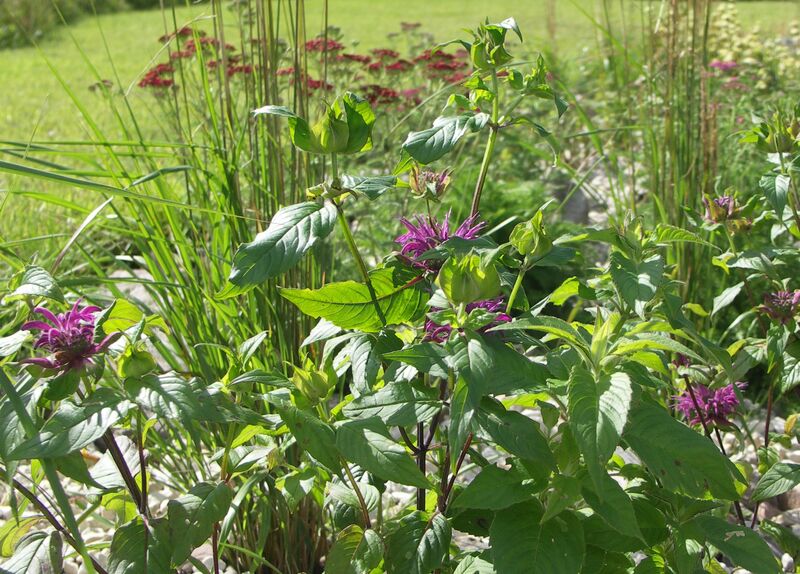 Monarda ‘Prairenacht’ has rich violet- purple whorls of flower up its stem, smells delightfully of bergamot ( as used in Earl Grey tea) and is a haven for bees justifying its common name of ‘Bees Balm’. 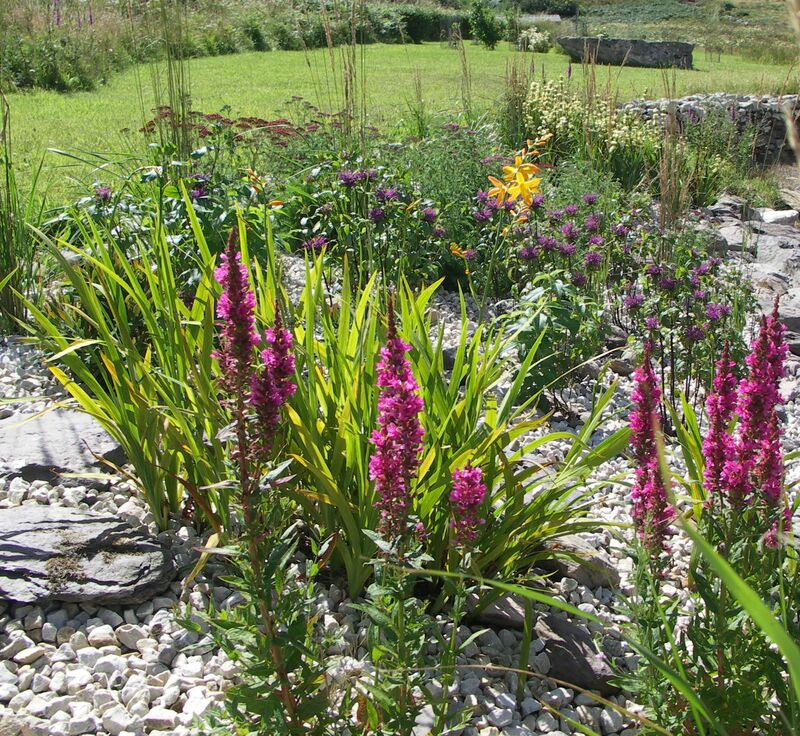 It is also in the picture below with the loosestrife and crocosmia. 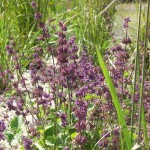 Pink spires of Lythum salicaria ‘Robert’ look attractive through the summer. 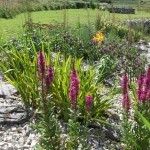 It is a cousin of the native purple loosestrife which grows abundantly with the native orange Crocosmia or montbretia. Here it is planted with a pale tangerine Crocosmia ‘Canary Bird’ as a natural companion. 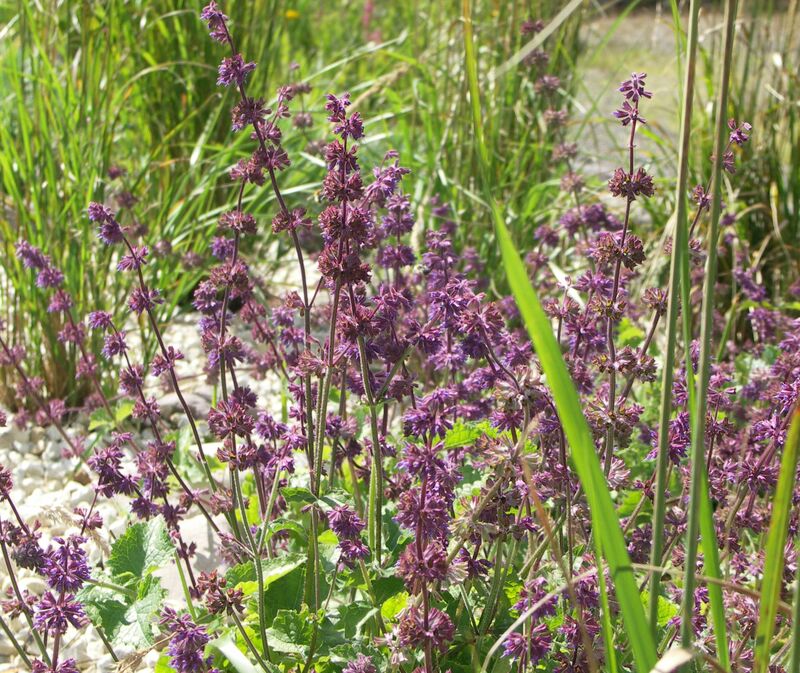 This ‘Purple Rain’ variety of Salvia verticillata has a long flowering season to display its red-purple stems with its whorls (hence ‘verticillata’ which means whorl) of purple flowers. 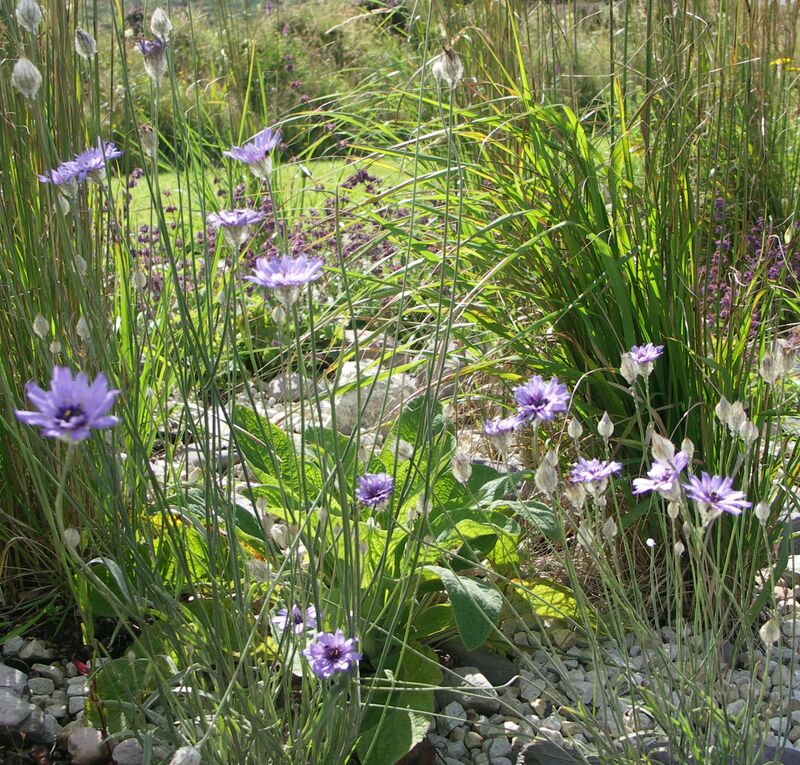 Delightful pale lavender-blue flower heads with dark blue centres (hence ‘caerulea’ which means dark blue) on grey-green wiry stems catch the sea breeze and are a very pretty companion for grasses. Papery buds and seedheads are attractive too, but their heads are cut as they die to prolong the flowering for as long as possible. The bluer patch of the border is introduced by junipers and heathers and spring colour is provided by narcissi, tulips and alliums throughout. The planting of this marine border was started in September 2012 and is looking good less than a year on. 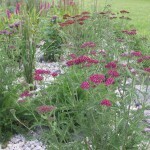 It is planted through weed control fabric mulched with gravel which also retains moisture, deters slugs and provides protection from drying winds. 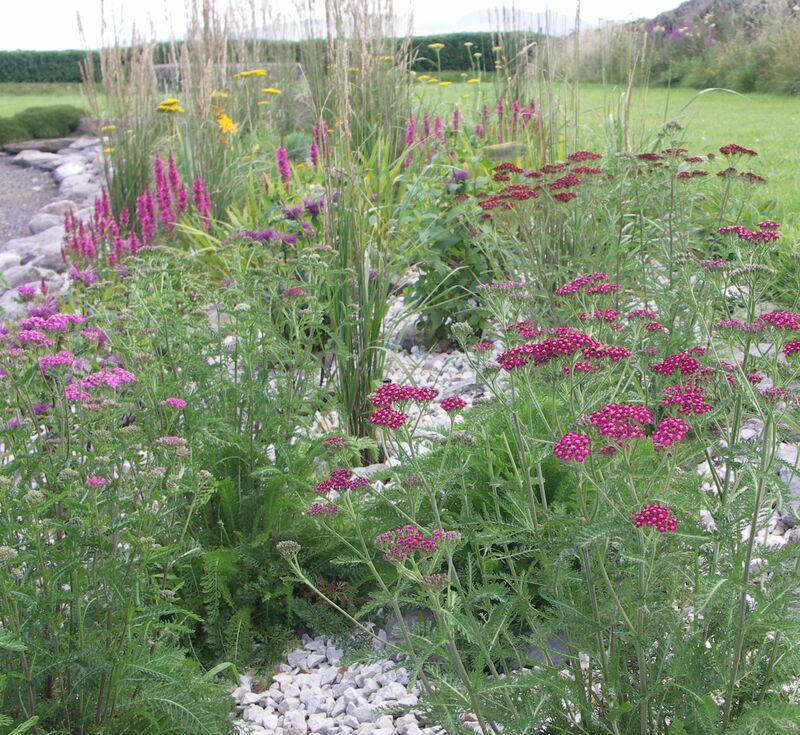 This entry was posted in Marine Border and tagged Bees and Butterflies, Garden Design, Kerry, Leaf & Acre, marine, native plants, Perennials and Grasses, Planting Design, seaside on August 12, 2013 by admin.